Early advertsing photograph of model wearing Spirella corset. 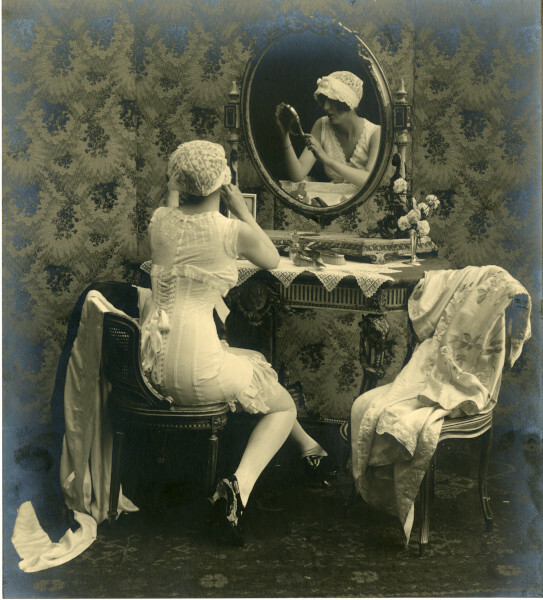 A black and white photograph from around 1910 of a model posing in a Spirella corset. She sits on a cane-backed chair in a bedroom setting. Behind her are thick fabric hangings with a floral pattern. On the floor a patterned carpet. She sits in front of an elaborate dressing table with an oval mirror with her back to the camera. On the table, which is covered by a lace cloth, is a small vase of flowers and what appears to be a silver dressing table set of two brushes. The reflection of the model in the mirror shows her looking at the matching mirror. She wears a lace cap and a corset tied at the back with large bows from the criss-cross pattern of the tapes. The corset is quite long and ends in a frill and suspenders. Under the corset is a cotton chemise and the model wears stockings and black court shoes. There is a length of dark coloured fabric, probably velvet, and a light coloured one of probably a silk-type fabric, arranged decoratively on the back of her chair. There is another small chair in the picutre on which a light coloured garment is draped. It is embroidered with flowers and could possibly be a dressing gown. There are two other similar photographs in the set, 100.246.10 and 100.246.11. The photograph is stored in a card cover, 100.246.12.1.